Controlling where wild rabbits live can be a difficult task. Wild rabbits will live anywhere they feel safe, including places like a front lawn. These are not safe places for rabbits, and creating a nesting area for them is the best way to control where wild rabbits are going to live. 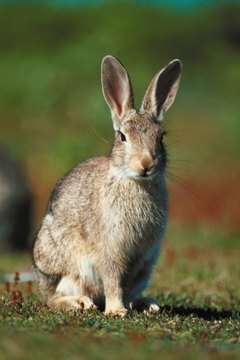 Improve existing cover for rabbits. This is one of the easiest and best ways to build a nesting area for wild rabbits. Piling limbs and brush materials alongside trees and fence lines will create perfect shelters for wild rabbits. Letting vegetation grow instead of mowing weedy areas will also improve shelters for rabbits. Any briar and brush patches that are allowed to grow will create nesting and escape areas for wild rabbits. Add fence rows to locations where rabbits are located. Prime locations for fence lines include a tree line or pond. Fence lines add extra cover for wild rabbits, and natural grasses and weeds that grow along fence lines provide shelter. Fence lines with weeds also provide escape routes for wild rabbits, and allow them to run from one field to another safely. Fence rows can provide food and food storage during winter months as well. Create new cover and nesting areas in places that lack resources rabbits need. Clearing brush to the edge of a property will instantly create new nesting areas. Keep adding brush to these areas. Piling the brush over large rocks, used farm equipment or any large discarded item will create a better nesting area. Keeping the brush slightly off the ground allows rabbits to move freely. The closer these brush piles are to permanent structures such as briar patches, woods or fence rows, the better the nesting area will be for wild rabbits. Make sure the nesting area has proper drainage. Flat areas in places that encounter heavy rains can lead to flooding of nests and places where baby rabbits would live. Make sure that rabbits have ample food and water sources. No matter how good the shelter is, rabbits will not live there if no food or water is available. Rabbits can eat hay, veggies, fruit, grass and some weeds. Much of their water supply actually comes from the plants they eat. During warm summer months they do need a creek, puddles or a decent rain water supply. Prevent rabbits from wreaking havoc on a garden by creating food sources and shelter away from garden areas. Provide white clover, Korean lespedeza and crabgrass near their shelters since these are important summer foods. Locate places where food can be added and rabbits will not have to expose themselves. Wild rabbits would rather eat food that is nearby and keeps them hidden than travel to places where they can be discovered.